A D.C. activist and entrepreneur behind the #DontMuteDC campaign held a town hall meeting to discuss other issues in the District — gentrification, rising property taxes and the loss of black churches and black-owned business, to name a few — in hopes to form citizen committees to tackle those issues. After the successful #DontMuteDC campaign to restore the sound of Go-Go music on a historic D.C. street corner, the people behind the effort have new plans. A petition drive on the issue drew tens of thousands of signatures and even musical protests. 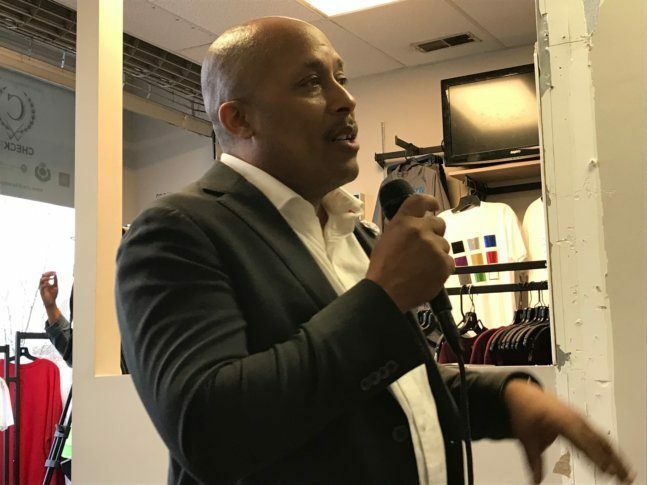 Ron Moten has seen this kind of energy for change before and has seen it dwindle as quickly as it rose. “You get people to come out, they’re emotional. And then it’s almost like you’re high off of sugar. You start off hype, and by the end of the day you’re just like ‘OK, I’m out of gas. We’ve got to stop that,'” he said. Moten, an activist and entrepreneur, held a town hall meeting Thursday night in Anacostia to talk about a wide range of issues. Gentrification was the main topic, and attendees also talked about the loss of black-owned businesses and black churches in the city, rising property taxes and a lack of music education in schools. Moten is forming citizen committees in hopes of tackling these issues. “The committees are to come up with solutions to the problem — and action. And also to lobby for those things that they come up with,” he said. As for the more than 70,000 people who signed the #DontMuteDC petition? “We’re going to thank them and do something with that to keep them engaged too,” said Moten. Among those attending Thursday’s meeting was Go-Go performer Michelle Blackwell. She said the initial decision by T-Mobile to respond to a new neighbor’s noise complaint by telling a local cellphone store to shut off the music it had played outdoors since 1995 was hard to take. “At first it was disturbing, but now I’m kind of glad that it happened because it allowed us again to shine a spotlight on our music to people who wouldn’t normally be talking about Go-Go. Now they’re talking about Go-Go. And also for us to come together to find some solutions to other problems that kind of got us here in the first place,” she said. Blackwell pointed out that people from other places who may not be familiar with D.C.’s history and culture are regularly moving into the city. “People that live here, they moved here, they’re here. There’s nothing that we can do about it. But we need to figure out a way now that we can interact with each other in a more positive way,” she added.